Junior Isabel Flens passes the ball. Flens scored both of the Cats' goals in their crushing 3-2 overtime defeat at the hands of Stanford. The Wildcats were good, but ultimately the Cardinal were lucky. Early in the sudden death overtime period, officials didn’t stop play after the ball appeared to hit a Stanford player’s foot, allowing Cardinal attacker Lauren Becker to race uncontested into the 25-yard circle and past onrushing Northwestern sophomore goalkeeper Lindsay von der Luft. Midfielder Sarah Helgeson took Becker’s ensuing pass and finished into an empty net, giving No. 9 Stanford (9-3, 0-1 America East) a 3-2 overtime victory over No. 14 NU (9-5, 2-2 Big Ten) Friday at Lakeside Field. The overtime controversy overshadowed a strong NU performance. The Cats earned 11 penalty corners to Stanford’s five, and held a 10 to four advantage in shots on goal. Junior midfielder Isabel Flens scored twice from corners, increasing her team-leading goal tally to 13. Flens opened the scoring 20 minutes into the match, knocking home senior back Lisa McCarthy’s corner from approximately 15 yards out. The goal came during a spell of sustained pressure from NU in which they earned five corners in 10 minutes. The Cardinal, however, responded quickly. Maddie Secco redirected fellow Stanford midfielder Fran Tew’s cross from the left side past von der Luft fewer than five minutes after Flens’ goal, knotting the score at 1-1. Stanford added another before halftime when defender Caroline Beaudoin scored via a penalty corner in the final minute of the half. Trailing 2-1, the Cats came out aggressively to begin the second half. Cardinal goalkeeper Dulcie Davies made two point-blank stops of Flens shots early in the half, and NU earned four corners in its opening 10 minutes of the period. Davies, who finished with seven saves, at times seemed to singlehandedly maintain Stanford’s lead. The dam finally broke, however, after a continued onslaught of Cats pressure in the final minutes of regulation. With just 3:35 remaining, Flens once again took McCarthy’s penalty corner and fired it past Davies, sending the NU sideline into jubilation and the match into overtime. “We did a great job of drawing corners today,” senior midfielder Charlotte Martin said. Stanford, though, needed little more than two minutes of the extra period to find a winning goal. The Cats, however, had several opportunities to win in regulation. 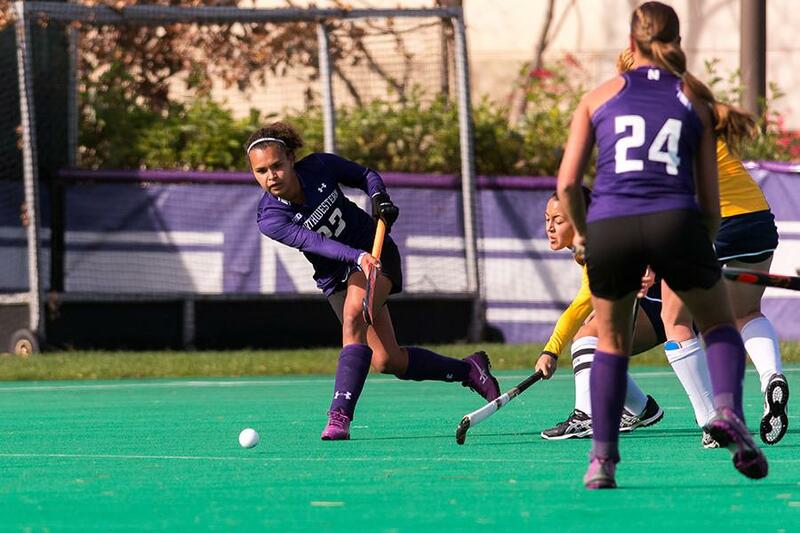 On one sequence, three NU players converged on the circle, but despite a loose ball just inches from the goal and a mostly empty net to shoot at, the Cats could not find a way to nudge the ball across the line. Despite surrendering three goals, Fuchs said the inability to finish chances was what cost NU the most.